Legend has it that the mansion owner went crazy after slavery was abolished, and in his rage, he killed all of his slaves and their children. Some stories say he even killed his family while he was at it. Then he killed himself. Now, folks say, an unexplained light comes on in the bell tower, or even the ringing of a nonexistent bell. Also, apparitions and orbs have been spotted; some have been seen through the windows. Eerie sounds and feelings have been reported as well. Since the house was built in 1875, long long after slavery was abolished and The Indiana Supreme court freed all the remaining slaves in the state two years before Josephus Wolf was born – This account as to the alleged haunting is doubtful. You are correct . There were never slaves in Indiana . In fact Indiana was a major route in the underground railroad. House wasn’t finish until early 1900’s as a wedding present to his wife. The monks used this house while the seven dollar shrine was built. So highly doubtful of any slaves there and he didn’t go crazy and kill anyone. Plus that is not a bell tower people. It is a capula. His long lost brother is actually burried in bovina tx. My family actually knew the wolf family personally and I’ve been there many times myself with no issues or problems there. The cross you claim was painted in the capula for sickness is wrong. It was done when the monks moved into it while the shrine was being built. Please get your facts straight or ask for them before adding to lies about this mansion and what happened to the wolfe family. I lived there for 3 months and the place is haunted.I was told that the house was once the county seat and many town meeting .I was told that Mr Wolfes wife and children all died of illness and he hung himself in the tower.there are bodies buried on the ground s in marked. No the wolf mansion is a house I thought don’t people live there? The unexplained light is probably the people who live there turning on the light and the unexplained people in the windows is the people who live or work there. walking just outside of this house. Heard voices. I have seen many things, I’ve seen ghosts. It wasn’t slaves he killed. He helped slaves go north. According to my family records, the plantation people who once lived in homes around the once built plantation had some illnesses. These people were there as workers, not slaves. Mr. Wolf was having an affair with on of his house aides. He didn’t know she was carrying a sickness that was unknown of,at the time. His house hold became very sick and his youngest child became ill, she died, No records show of her death because he thought it would hide the sickness. She was buried in an unmarked grave, secretly. But this didn’t stop the sickness and it spread through out the house and plantation. A cross was painted in the capula as a sign to warn off people to tell them not to enter because of sickness. Many people died. His wife, saddened by the loss of her child, plus one still born, that she gave birth to in her room, caused her to commit suicide. She hung herself in the capula. Mr. Wolf died from cancer. Workers left and moved away. The plantation was torn down and the house left to remaining family until they also passed. It now belongs to the historical society. I could get records to own it but, no thank you!!! Ironically enough, after I had my 2nd husband visit the grounds of the house with me, he was dio. with cancer and he was chased off the land by Mr. Wolf’s voice. My now dead husband, worked on that house when it was becoming a flower shop, it was a bad experience for him. sad, I love the look of this house, but I wouldn’t wanna own it. People move out every 3 months, if people would stop changing the looks of this home and put everything back to the way it was, encluding the removed bodies, all would be ok once again. Yes the house was built in 1875 a lot of people think Mr. Wolf killed himself, family, and the slaves he swore he would help. 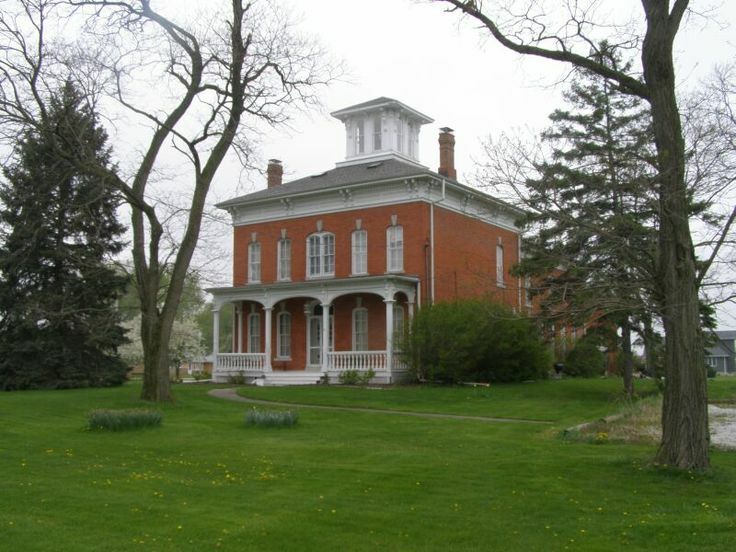 My family’s lived in Porter County for years and they know a lot about this at one time really pretty home that has had one to many face lifts to which a lot shouldn’t of had to of done causeing a lot of the noises and lights going on and off at night. Plus they did take down four buildings on the property which used to be 4,500 achers and now present day it’s only 5.2 achers a lot smaller then years ago only because it used to be a farm it had beef and dairy animales then people wounder why the ones who buy the house only get told to leave, scared off, or something bad happens to them or their whole family. Hey do you mind telling me a little more about this…. ? Sounds like Nobody knows the “Truth”..And if the “Entire family was slaughtered”, there are no descendants..Still a really neat place tho. I live literally down the road from Wolf Mansion. This house was built way after slavery. The family members each died of natural causes. And they are buried in the McCool Cemetery on the Corner of McCool Rd. and Central Ave. in Portage, IN. And the building is privately owned. They have made it a tourist attraction. In fact they give tours of the house. The ‘Wolf’, as its now named according to a landmark sign in front of the mansion is 3 miles down the street from me. It now occupies the elderly as a convalescent home. If it truly were haunted, who would believe the words of an occupant with dementia? Being trained in the medical field I just realized that I could in fact apply for a position there. Da, da, da…..to be continued! I personally am not afraid. Not to say that the rumors arent true, but my home was built in 1895, 20 years after the mansion. Ive heard my fair share of the unexplained. I lived there when i was about 5 yrs old. ALong with my mom and dad and 4 sisters and 2 brothers. Dont remember exact yr, as my memory is bad. But my mom and dad had an antique shop there. My mom always said it was haunted. I was the youngest and always scared to go to the bathroom when upstairs. There was a long hallway with the bathroom on the right. All the other doors along the upstairs hallway were shut or locked. I do remember being scared in that bathroom, just an eerie feeling. My brother could prob tell more and sister , the two oldest kids, It was prob in the 1970ish, There were graves in the backyard with tombstones. Dont know the exact story. But i use to have tantrums when they took me upstairs to bed, and would cry myself to sleep. I don’t know about all of these different stories, I do know that I have had several encounters with this house over the years, I was driving home one evening west on 700 past Wolfe mansion and the light in the tower was on I have had that experience several times while the house was sitting empty some times the light would be on and sometimes it would be off…. the ironic thing was I have been in the house and the stair case leading to the tower was walled off with drywall. I remember seeing that light in the bell tower on when no one was living there too. Then on the way back later that night it was off. Very freaky as don’t understand how that light could of came on in the first place when it was vacant. Made me a believer. I remember a particular experience from when I was 3. My grandmother lived in Valparaiso, and my parents had to drive by the Wolf Mansion in order to get to and from her house. I remember asking my parents who the ‘creepy lady’ was, and I stated that she had white hair and a white face, and a frilly and old looking dress, and she was in one of the second floor windows. My parents didn’t see anything when they looked, but that is the only experience I recall at that location. There was a 20 something year old, whose parents owned the house, hung himself in there in 1996-ish. I knew him from the local bar, Pepe’s Silver Bullet. Think his first name was Dan. He thought he was a magician or something. Well, he could not get out of that rope! Slavery was abolished in 1865, so this is true. His self hanging was over a girl & nothing to do with the house. He was just a weirdo. I was subcontracted by 2 different owners after 2000 to trim the trees. The first time the owner had an old map of graves and many structures that are longer exist. This owner and the next owner mentioned multiple tombstones stored in the cellar, due to previous vandalisms. Both owners mentioned lights flickering, voices, and especially oddities concerning the tower. I was born in Valparaiso and am a descendant of the Wolf’s through Caroline. My dad grew up on a farm a half a mile away and wet to many family reunions in the Wolf Mansion. STOP these lies! Joeseph did not kill his slaves. He did not own slaves. He helped to free them. The bell tower is not a bell tower, it is a crows nest. He was proud of his success in life and wanted to be able to see all of the property he owned from his house. He likes to go up there and look across his land. The only murder was his own. He was shot by someone at night as he stood in his doorway. You can read the story about that in the newspaper report. Please stop making my family seem horrible. They were not perfect people but they were absolutely not murderers! The house is, however, haunted according to several family members. Do the current owners allow paranormal investigations if we pay to do them? That was the story i was always told about some old woman with white hair in the tower. Wounder what role if any she had in the history of wolfe mansion. I LOVE THAT HOUSE .I TOOK A TOUR 2015/2016 .SINCE I WAS 13 YEARS IM 70 NOW I WANTED TO LIVE THERE .IM NOT AFRAID. I EVEN ASKED THE OWNERS IF I COULD RENT A ROOM. BUT THEY SAI.D NO.I WANT TO BE THERE GO BACK.i told my granddaughter she wants to go. I went to the library copied everything still have it.i will give it all to the owners. They are so nice.i wish i could live there.is been my dream. attic of the barn/garage doesn’t sow seeds of comfort along with the voice in my cousins former room. The basement is damn near freighting. At any rate I would be happy never to return there.